Equipment that is to be moved around will benefit from being moved and perhaps operated inside a protective carry bag. 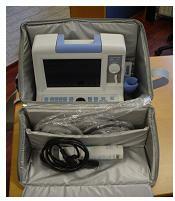 Imaging Systems provides custom hand built carry bags for some our ultrasound scanners. These bags are padded, with velcro flaps for probe and power lead connection. The bag can be easily wiped down with a damp cloth. Contact our office for more details about our custom made carry cases.